A site devoted to Stuart Schneider's Antique Frame Museum & Gift Shop. If you collect any type of art and display that art, it will look better if you use a period frame. Years ago, frames could be found in the back of antique shops and they were priced very inexpensively. For the most part, that time has passed and a dedicated corps of antique dealers has recognized the value of early frames and prices them accordingly. Some of these frames are beautiful examples of folk art, while others can be dated to a particular style (ie. Eastlake, Art Deco, Faux Bois, etc. ), while others were only made for, at best, 5 years (Ripple-style frames). Hopefully, you will now go out and try to find some great frames. A collection of beautiful empty frames on a wall is always a conversation starter. Note: My 2nd frame collecting book went to the publisher in October 2015. I received a call (11/10/16) from the publisher saying that they are not able to publish it as the market for picture books on antiques and collectibles is very soft. I'll just keep updating it and hope that the market comes back some day. 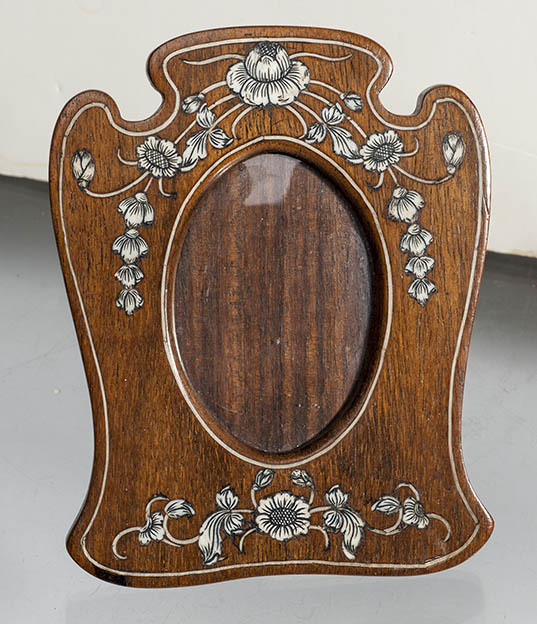 A Beautiful small Fruitwood frame dating from 1835-1845. The photo does not capture the depth & shimmer in the grain. It is 5 1/2 x 6 1/4 inches od. and has a 3 5/8 x 4 3/8 inches pic. size. An early yellow pine frame dating to 1835-45. Never seen one quite like it. It contains an N. Currier print from the 1840s. It is 14 x 18 inches od. and has a 10 x 14 inch pic. size. Rabbet or Inside Size: Frames are most often referred to by their rabbet size. The rabbet or inside size is the opening on the back of the frame into which the glass, mat, and artwork fit. Frames are usually cut a bit larger than the desired rabbet size. This provides a little bit of extra space so anything that is the actual size (i.e. the glass, mat, and artwork) will drop into the frame without resistance. For example, an 8x10 frame is likely to have an actual rabbet or opening of 8 1/4 x 10 1/4. Outside Size: Frames are often referred to by their outside size. When you look at the front of a frame and measure from outer edge to outer edge, of the frame this is an outside dimension. The two outside dimensions tell you how much space the frame will require on your wall. Sight Size: This is the size of the frame’s opening when viewed from the front. The sight size is measured from the inner edge to the opposite inner edge - through which your artwork will be visible. Most frames have a 1/4” rabbet on each side - meaning 1/4” of your artwork will be hidden behind the frame on each side. 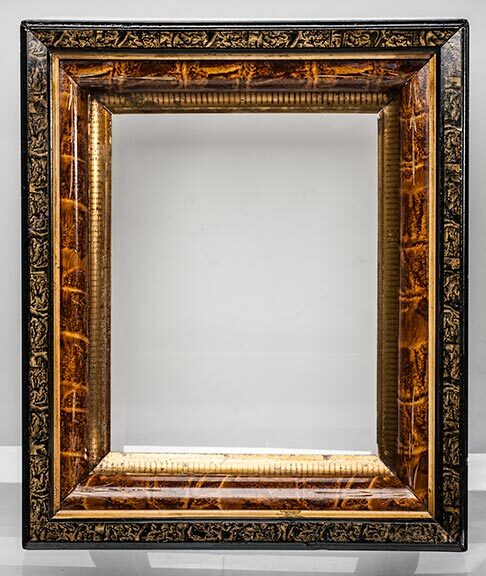 Ca.1875, faux alligator middle frame, gilded sight, faux tortoise outside frame. I have never seen a faux alligator design before this. It is 12 x 14 1/2 inches with a 8 x 10 inches pic. size. A bold c.1874. Faux-bois in black, tan, & grey with a gilded sight and Eastlake-style decoration. This is an unusual frame as it looks like a c. 1868 piece with the addition of Eastlake decoration. I believe it is an earlier frame that the frame maker had in stock for a few years and added the Eastlake embellishments to take advantage of the "new" style. It is 11 3/4 x 14 inches od. and has an 8 x 10 inches pic. size. A superb, ca.1890, French walnut, desk frame with Art Nouveau design inlay in bone. It is 4 3/8 x 5 1/2 od. and has a 2 3/8 x 3 3/8 inch pic. size. A superb, solid, larger, Tiger Maple frame from the 1840s. It is 13 1/2 x 17 1/2 od. and has a picture size of 10 x 14 inches. This site is divided into frames shown by date when they were made. From Collecting Picture and Photo Frames, copyright S. Schneider. Do not use without written permission. 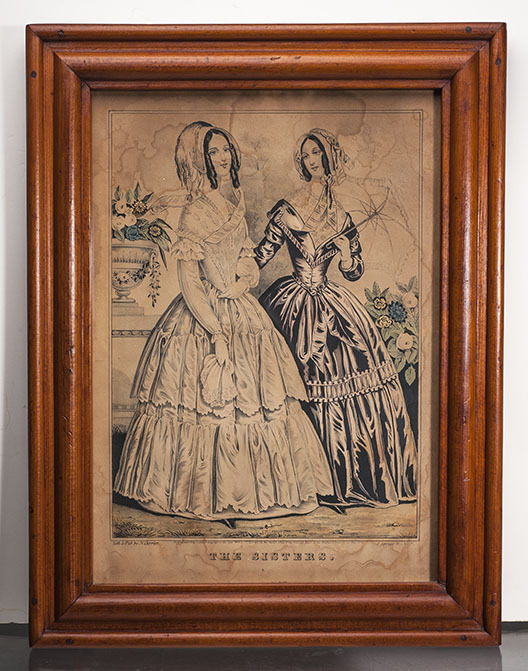 Collecting picture frames, from the 1800s and after, has only recently become popular. 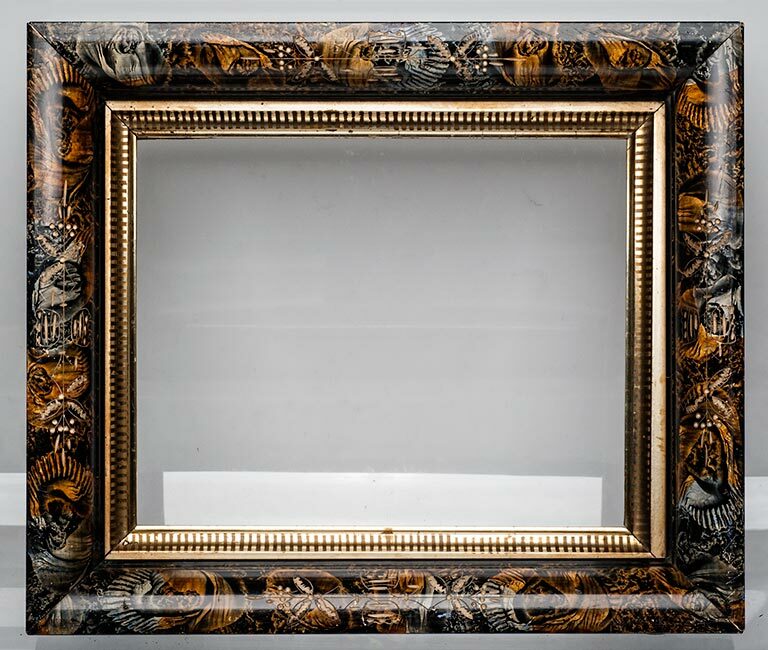 A few years ago, frames, with exceptions of the ornate, the early or the unusual, would be thrown in a box in an antique shop or flea market and priced at a few dollars. Those days are almost gone. More dealers are familiarizing themselves with the demand for quality picture frames and charging and getting what the market will bear. Picture frames draw the eye to and beautify a picture as they separate the picture from its surroundings. But the wrong frame can overwhelm the image and look tacky. The evolution of a frame surrounding a picture has occurred over a period of about 700 years, although common usage has only been around for about 400 years. The concept of what a frame is supposed to be also keeps expanding. It becomes more than a border surrounding a picture. The right frame pulls you into to the picture and highlights it. It accents or isolates the image. It may emphasize the importance of a picture or help connect several similar pictures. The shape and size of a frame can add to the power or message of a picture. A frame too heavy or too busy can overwhelm and distract from the picture and affects the way the picture within is perceived. The idea of framing pictures may have first occurred in churches in the 1300s. They appeared on religious paintings and often resembled windows, arches and architectural elements of the church. This style is often referred to as Gothic. These earliest of frames were made in Italy and Holland. They are few and far between on the antique market and are not usually available to frame collector outside of the limited availability at some English auction houses. Most reside in museums and churches. For the next several hundred years, frames appeared in churches and homes of the wealthy or the royalty. The average person did not have “moveable” paintings in their home. They were more likely to have a painting executed directly on a wall. Frames continued to be hand made and too expensive for the average home. By the 1690s, Paris was the most important frame making city. Frames were carved of wood and assembled by furniture makers. In the young American Colonies in the 18th century, frames were made from simple local woods, hand decorated to resemble costly wood, or, for wealthy patrons, imported from England or France. These ornate frames can be seen on paintings from the late 1700s. Frames followed the popular furniture and artistic styles of their day. From 1800 to about 1830, an American furniture style called “Federal” was in vogue. Frames were made in the Federal style and often have columns in the inner moulding or an eagle at the top or a delicate use of applied composition decoration to the corners or edges. These are most often seen on period mirrors. Mirrors and art began to appear in middle class homes. For the poorer country cousin, an American country style frame of this period may be simple planed wood with a simple gilded surface. From 1830 to about 1850, styles became popular that were influenced by the French artists designing for Louis XV. Gold or silver leaf generally covered the entire frame. Scalloped edges with delicately applied ornamentation appeared on most expensive frames. On simpler frames, the gold or silver leaf was often only applied to the front surface and the sides were left plain. Miniature paintings were popular and frames for them were available in simple black lacquer or ornate brass embellished woods. American country style frames of this period may appear with a simple rippled or grooved wood with a painted surface or again with a painted false grain look. The painted surface was originally introduced to replicate expensive imported woods found on formal furniture. From 1850 to the industrial age of the American Civil War, the art of the frame exhibited incredible growth. More people had paintings. Photography was becoming popular and lithographic prints were available for very little money. 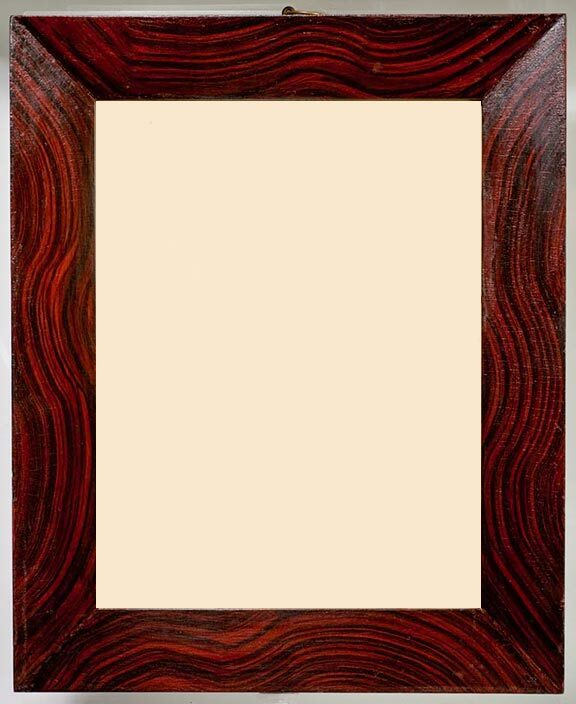 Inexpensive veneered wooden frames were available for the popular woodcut or lithographic prints that appeared in women’s magazines. More elaborate frames exhibited natural designs in the applied ornamentation. Popular were leaves, vines, and berries. Machines, manned by moderately skilled labor, could now make what skilled artisans had formerly made by hand. Walnut was a popular wood for frame making and with the new machines, complex walnut mouldings could be easily made. A style called Gothic Revival enjoyed modest popularity. It was characterized by church architecture inspired embellishments. During the American Civil War (1861-1865), the popularity and the availability of photography, due to its low cost, appealed to every class of man. Frames were made by the hundreds of thousands to accommodate the outpouring of pictures. The most popular frame embellishment for the period 1860 to about 1875 was acorns and oak leaves. This acorn and oak leaf design sometimes appears into the 1880s. Walnut frames with gilded sight edges were abundant for larger photographs and prints. A style that lasted into the 1880s was the Eastlake style, named after Charles Locke Eastlake, an English architect who wrote a popular book entitled, Hints On Household Taste. The book discussed Eastlake’s ideas of what art, furniture and architecture should look like. Eastlake was the inspiration, not the maker. One Eastlake principle was that wood, if painted at all, should be painted a flat color with a line introduced here and there to define the construction. Angle ornaments were acceptable at the corners. Frames in the Eastlake style can be found with delicate white incised designs on a darker background. Other embellishments might be rods, balls, spools and spindles. Another form - The Arts and Craft style - used simple oak and natural finishes, usually created by hand. Metal parts were hand wrought. The Arts & Crafts movement had been building over a period of years. William Morris, an English designer had written and spoken out in the 1870s about the industrial age furniture that was almost entirely machine-made. He claimed that it was not artistic and lacked “soul”. The Arts & Craft movement was supported by the wealthy. They wanted art and could afford to commission hand-made pieces. When the wealthy became interested, manufacturers became interested. The Arts & Craft style did not need highly skilled labor, nor time intensive manufacturing techniques. It was perfect for the masses. Again the factories began to churn out pieces made in the style and one no longer needed to be wealthy to afford artistic furnishings. Pieces in this style were made into the 1920s but the bulk of the items were made from 1900 to 1908. The Aesthetic movement used products from nature, but added gilding or other embellishments to make them more aesthetically pleasing. Unlike the Arts & Craft style, the designers did not believe that the only way to accomplish this was by hand. Aesthetic frames may be difficult to distinguish since they can often be classified as other styles of frames or grouped generally under the “Victorian” heading. One of the strongest styles to influence art and frames was Art Nouveau. It originated in France and was exemplified in the World Exposition in Paris. It quickly spread world wide around the turn of the century. Art Nouveau stylists wanted to return to nature. The Art Nouveau style introduced flowing lines from nature such as water lilies, vines and swirling roots and tendrils. In the straight lines of wall frames, you will not find many Art Nouveau pieces. They exist primarily in the metal table top frames, with the best being executed in bronze or copper with colored touches in enamel. A different style, popular about the same time, was the Rustic look. In an attempt to flee from the formal, “everything must be perfect”, Victorian life, a masculine response was to go to the mountains to hunt, fish and experience nature. In the east coast of the United States, this meant the Adirondack mountains. Beginning about 1875 and continuing to about 1930, wealthy New Yorkers built splendid hunting and fishing camps in the mountains. Their craftsmen used natural wood, with the bark often in place, and pine cones and acorns, to embellish furniture and fittings for the cabin. The style soon made its way back to more formal settings in the city. Wonderful rustic frames appeared, made with pine cones and natural looking pieces of wood. Interestingly, an earlier Gothic Revival rustic style was popular in the 1840s to the 1860s when Americans were conquering wild areas of the country and making furniture out of whatever was on hand. It is unlikely though, that many picture frames were made in the Gothic Revival rustic style in the period before the Civil War. While not actually a furniture or art style, Tramp Art frames were made from the 1870s to the 1930s. As the story goes, tramps and itinerant artists who traveled the roads and rails would gather old pieces of wood (often cigar boxes) and carve, shape and glue the wood into useful objects such as boxes and frames. Occasionally the pieces were painted, but most were just varnished or shellacked. They sold or traded these for food and shelter. The majority are chip (also called notch) carved and made up of layers of this carved wood. Chip carving is a way to decorate wood using just a knife to cut out pieces of the wood in a repetitive pattern. It was a simple and quick method of wood carving. The table top frame made its appearance in the 1840s as the daguerreotype case. The daguerreotype, a photograph on a silver plated copper plate, was the successor to the miniature paintings, popular in the 1810s to 1840s. Before photography, the only way to capture a person’s likeness was in a silhouette or painting. The paintings were expensive and time consuming when done by a talented artist and the silhouettes did not capture what the face looked like. A photograph was much faster and substantially less expensive. Miniature paintings were hung on the wall. The daguerreotype, done on a mirror-like surface, needed to be tilted just right to view it, therefore it was difficult to get the viewing angle correct when hung on a wall. The daguerreotype was set into a case and the case was placed on the table. In the 1850s, the Ambrotype photograph replaced the daguerreotype. About 1860, the tintype and paper photographs, mostly Cartes Di Visites (CDVs), began to replace the earlier photographic methods. CDVs were made by the millions and very reasonably priced. Special albums were made to hold them and some table top CDV frames began to appear. About 1870, larger numbers of table top frames emerged. The table top frame “craze” took off about 1880. Soon, thousands of table top frames appeared. 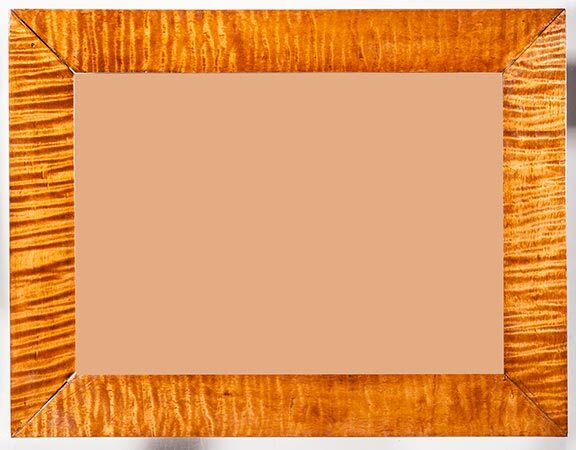 In Victorian society, wall and table frames were the way to exhibit photographic or small painted portraits. Heavy silver and gilded brass table frames were popular. The standard place in the house to exhibit photos was on the fireplace mantle. In time, the mantle became overcrowded and new places were sought for the photos. An overmantel was created to hold more pictures. As the overmantels became encumbered, tables, easels and shelves were used to hold the overflow. The cluttered look of Victorian rooms was probably caused by too many table top picture frames and their accompanying places of display. 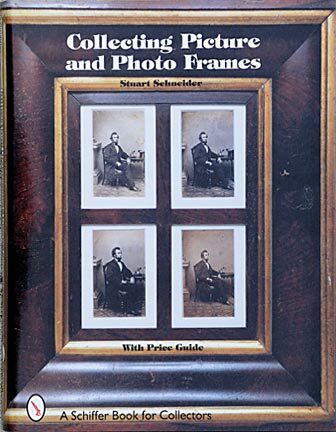 Collecting Picture and Photo Frames is the best book for those interested in old frames. It covers all styles such as Eastlake, Art Deco, Art Nouveau, Folk Art, Tramp Art, Rustic Style, all types of wood and painted finishes from the period 1800 to about 1940. It also covers Table Top frames from 1840 to about 1950. Overall size is 8.5 by 11.0 inches. The book contains over 650 color photos and includes a valuation guide. Hardcover, large format, regular price $39.95, my price $34.00 plus $4.00 towards postage (in the US. Check with me for shipment overseas. Postal rates keeps changing). A super, faux bois, bold, hand-painted finish from about 1840. It is 11 1/8 x 13 5/8 inches with an 8 1/2 x 11 inch image size. A wonderful folk art piece found in Pennsylvania. Wordcraft.net - My companion website has many more things - The Halloween Museum, Flashlight Museum, Fluorescent Mineral Museum, Space Collectibles Museum, Quack Medical Devices (Galvanic Batteries), Abraham Lincoln Museum, Waffle Recipes, My Law Practice, Halley's Comet Museum, and my Ghost Photography and "Ghosts In The Cemetery" books, and my other 18 books on Antiques and Collectibles and Fluorescent Minerals. Copyright 2017-2019 by Stuart Schneider. Do not use any parts of these pages without written permission.